Senior BJP leader and former Union minister Ashok Pradhan join Samajwadi Party (SP) today. Ashok Pradhan after joining SP says :"Worked in BJP for 46 years,was minister in Atal ji's Govt, now his legacy is over,a group has taken over BJP" In what could be a major jolt to BJP in Gautam Budh Nagar just ahead of the April 10 elections. 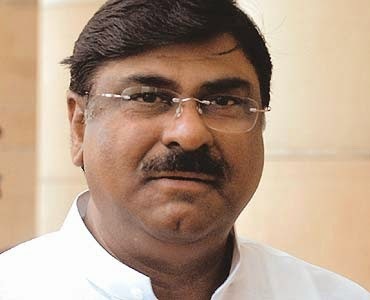 Pradhan is considered to have a significant vote bank in the region because he was a four-time BJP MP from the Khurja parliamentary constituency, which was reserved for scheduled castes before delimitation in 2008. He consecutively won the Khurja Lok Sabha seat — from which the GB Nagar constituency was carved out — in the 1996, 1998, 1999 and 2004 general elections. Pradhan, who had held important portfolios, including food and public distribution, HRD, telecom and IT, as a Union minister in the Atal Bihari Vajpayee-led NDA government at the Centre, is known to have enjoyed considerable clout in BJP. Following delimitation, Pradhan contested the 2009 general elections from the Bulandshahr parliamentary constituency, adjoining GB Nagar, on a BJP ticket but lost. He was upset after ticket from BJP denied this year.